The still growing middle income class in China and the central government’s encouragement to support domestic consumption is bringing about growth of the to the fashion apparel industry, especially Shenzhen where it is famous for its plentiful womenswear brands. It is also attracting foreign brands to come in as well as the textile producers in support of the local brands. Plenty of visitors came from all corners of China to to visit the 15th China International Fashion Brand Fair Shenzhen (SZIFB formerly known as SZIC)and 2015 Intertextile Apparel Fabrics Shenzhen Pavilion (ITSZP) at the Shenzhen Convention & Exhibition Centre (SCEC) in Futian district. After a few years of remarkable growth, the scene at ITSZP this year was steady, about the same as last year. 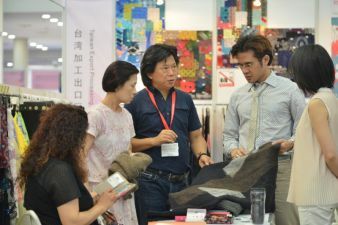 Almost 700 exhibitors were present at this year’s Intertextile Shenzhen Pavilion (ITSZP) event which took up 30,000 sqm spread over 3 halls - 6, 7 and 9, that being the larger hall where the Fabrics China Trend Forum was displayed to help buyers be aware of the trends in womenswear. The majority of the exhibitors were from China, and the international section in Hall 6 housed a total of 82 exhibitors with two major pavilions: Korea with 33 participants and Taiwan with 15. Others, 34, came from Kong Kong, India, Italy, Japan, and the UK. 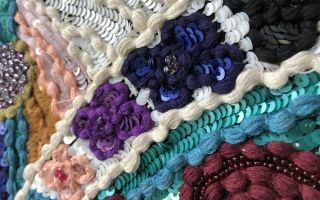 Product types included cotton, linen/ramie, wool, manmade, lace and embroidery, yarn & fibres, denim, heat transfer print, lingerie & swimwear, silk, accessories and etc. For the first time, a seminar program was conducted to meet the need for more information by the South China textile and apparel industry. A total of 5 seminars were held. Experts from different sectors were invited to share the latest industry updates on fashion trends, market information, branding strategies and more. The topic of ‘Key Womenswear Trends for Autumn/Winter 2016 – 2017’ and ‘Sourcing Strategy & the Concerns of Production Bases’ were very well received. Like last year, the Korean participation was strong with support from Korea Fashion Textile Association (KFTA) and Daegu Gyeongbuk Textile Industry Association (DGIA), as well as KTC – Korea Textile Centre. Mr Yoon of KFTA said Vietnam, for the first time, over took China and became #1 in Korea textile export destination market in 2014, followed by China #2, USA #3, Japan #4 and Hong Kong #5. He perceived that Vietnam market is growing fast as factories in China are moving from the coastal region to inland and offshore Their members are selling more and more to S.E. Asia e.g. Vietnam, Indonesia. Vietnam now is like China 15 years ago. He thinks S.E. Asia will continue to grow in the coming years. He feels S.E. Asia will continue to grow in the coming years. Although this show has been expanding, the most important is still the Show in Shanghai where it serves buyers from all over the world, while this one serves China only and more specifically South China. Korea Textile Centre made some business from last year’s participation, so they returned but in a smaller size booth, showing the products from its 60 members. Popular is rayon mixed items or 100% polyester or 100% rayon said Mr Kim Hong-ki, managing director. D2 Textile of Korea came for the first time to this Show. In the past, they have concentrated on the Korean domestic market and now they look to expand to the China market after finding out from friends that China is very receptive to Korea products, said Mr Yin Shan. They are in prints on cotton, polyester and spandex fabrics. Baek Yoon, in natural fibres of linen and ramie, joined this Show for the 4th time. They are producers as well as traders. They are producers as well as traders. “We rely on selling to the Shenzhen apparel brands”, said Ms. Zheng Yu-sheng, representative. The Taiwan Pavilion organized by Taiwan Textile Federation brought 15, three more than last year. Unitex is strong in lace fabrics and needle-punch. New this time were some tone on tone needle punch and 3D effect florals. They have been attending this show for many years. Joseph Chang, owner and chief designer felt the market is slowing down in China due to weaker internal and external economic environment. He thinks the China fashion apparel brands are more inclined to purchase fabrics from Taiwan and Korea to help the brands distinguish their collection from others as they cannot be found within China; that is why these two country pavilions are expanding. RMC - Royal Maye Chie Enterprise, a market leader for womenswear fabrics in embroidery of top quality. They showed embroidered fabrics with overprint. “Our China market has been growing” said Ms Judy Lin, vice president. “Beauty is not enough these days; it must come together with technology, usefulness and sustainability”, she added. Amiti International and Amiti JC Textile work as a team with production of printed fabrics in Elan near Taipei and sales in China. 20 years in the business they entered the China market only 5 years ago and have been growing ever since. “China apparel brands are getting to be of higher and higher quality. We serve many of the Shenzhen brands that are showing in SZIFB. We however are not out to serve everyone”, said Asina Liu, manager. Two year with this ITSZP fair she found business is good for them. From Japan came Progress Shanghai, a subsidiary of Yagi Japan. Progress was set up when Yagi planned to increase its sales its knit fabrics for ladieswear business. They do not own any production operations anywhere. They do R&D and design and contract the factories to produce for them. This year they will also set up Progess in Thailand. “Besides visitors from South China, we also received visitors from Hong Kong, Shanghai and Zhejiang and very few from the other provinces, said Mr Mao Jin-Hai, manager of section. Asahi Kasei Fibers International (Shanghai) of Japan promoted fabrics made from their famous Bemberg fibre made from the cotton seeds. The fabrics displayed are from Japan, China and Hong Kong. The purpose of joining this ITSZP is to let the apparel industry people know about Bemberg. This is our 2nd time at ITSZP and we are very happy with the turn out, receiving double the number of visitors this time than last year, said Mr Mo He-ling, manager. Sunwell (Shanghai) a Japanese textile trading company, has been joining the ITSZP show for 5 years. The fabrics are mostly made in Japan with some made in Thailand, Vietnam, China and Korea. They showed some unique fabrics made from triacetate mixed with polyester presently being used by some top international brands. “Most of the apparel brands in China use our products”, said Mr Hiroshi Kawabata, international sales manager. 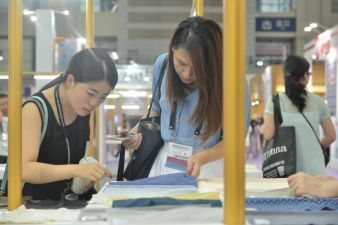 More than 600 exhibitors were from the key textile producing provinces of China, such as Guangzhou, Zhejiang, Jiangsu, and Fujian with a good number from Shenzhen. They have kept a keen eye on the womenswear business in Shenzhen and South China. Displays were arranged from product type: Lace, embroidery and wool took a large corner in Hall 6. Knits and cotton shared Hall 7 while Hall 9 housed man-made, silk and accessories. Other products of linen, ramie, denim and fabrics for lingerie swimwear, sportswear took up a small percentage. 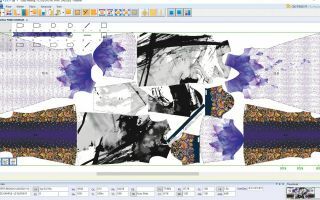 Shaoxing Digital Printing & Dyeing better known as Digitex specializes in digital printing producing 50,000 metres a day on all fibre types of fabric. Mr Charles Liao, sales department believes that this will continue to grow as this is the direction for printing. “Competition is becoming stiffer as import duties by the central government are greatly reduced and even elimination in some cases. Apparel brands such as Zara, H&M, Mango, Uniqlo pose a big challenge to the local brands. If, however, you have good designs that is suitable for the local market, you still can carve your turf”, he shared his perspective. In Conclusion Though the two Fairs did not show rapid growth like in the recent past years, it remained steady and maturing. The demand for quality no doubt is increasing and buyers are more and more sophisticated. A good and comprehensive apparel and textile fair is needed to serve the South China region. In a soft economic environment, the response to these two fairs by exhibitors and visitors is reasonable enough. The expanding middle income sector and the domestic consumption growth should be carefully watched as the China market is huge.